Donald Dell is a legend in professional sports. As one of the first agents to represent athletes, he's been negotiating mega-deals for almost forty years with a hugely successful record on behalf of stars like Arthur Ashe, Michael Jordan, Jimmy Connors, Patrick Ewing, Stan Smith, and Boomer Esiason. 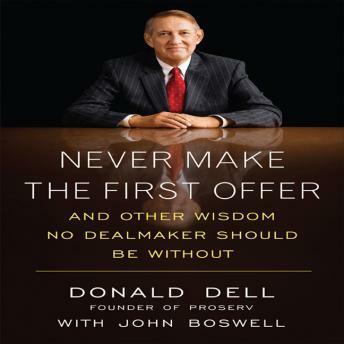  Never make the first offer: You're not seeking an offer at all; you are seeking information.  Business is emotional: If you are less than genuine. people will pick up on it, which is much worse than losing your temper every now and then.  Know your audience: I finally figured out the key to Jimmy Connors-play to his stubbornness. Don't force Jimmy to do something and he just might do it.  Decide what's important: Something extremely important to the other side may be trivial to you, in which case you can gain leverage by giving it to them.